On 8-11 November 2018, Georgia Tech Lorraine (GTL) and the Center for European and Transatlantic Studies (CETS) presented a series of events to commemorate the centennial of the Armistice of the First World War. 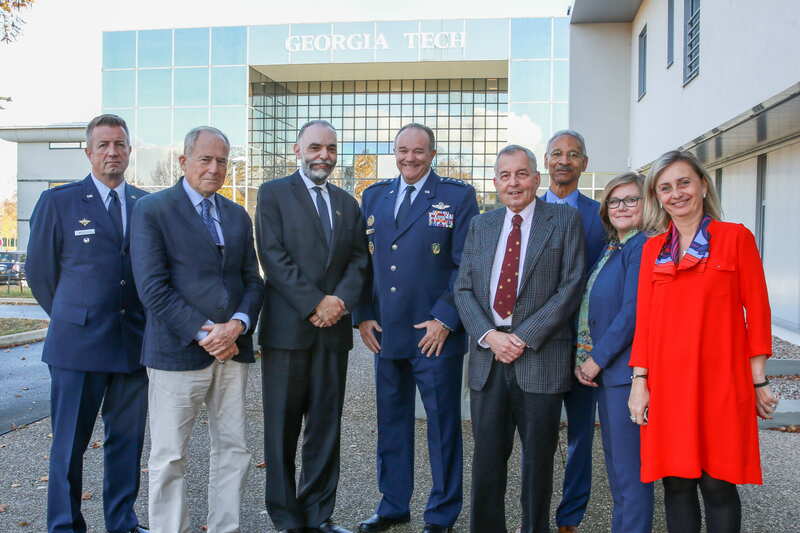 The program kicked off with a symposium held on the GTL campus program featuring a keynote address by distinguished GT alumnus, General Philip M. Breedlove, followed by presentations by Professor John Morrow, University of Georgia, a prominent scholar of World War One; Professor Seymour Goodman, Sam Nunn School of International Affairs, who co-organized the largest symposium on WW I in the state of Georgia; and Colonel William Woodcock, (USAF, Ret. ), a WWI historian. Dr. Vicki Birchfield, CETS Co-Director and Professor in the Sam Nunn School of International Affairs in residence at GTL until 2020, moderated the plenary session and Q&A with the audience of approximately 150 people (including students, faculty and representatives from local and regional authorities). At the end of the plenary session General Breedlove presented a special commendation to Mr. Gilbert Kesse, an 89- year old local “Messin,” who has carried the American flag in the Armistice ceremonies in Metz for the past 35 years. 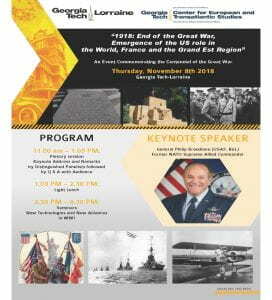 On Friday, November 9th Dr. Monique Seefried, historian and Commissioner on the U.S. WWI Centennial Commission joined the other distinguished participants and a group of GTL students and faculty to discuss WWI and the challenges of “devoir de memoire” or the duty to remember in the context of her work and the mission and activities of the Centennial Commission. This discussion took place during the group excursion to the following local sites that helped contextualize the significance of the Lorraine region and the linkages between three wars (Franco-Prussian 1870-71, WWI and WWII): Gravelotte Museum, Dornot-Corny Battlefield Memorial, and Maison Schuman. 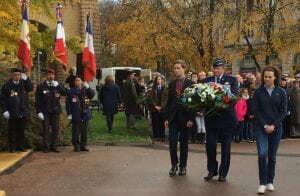 The day was capped off by a special jointly organized program with the Mayor of Metz featuring an address by General Breedlove and a presentation by Dr. Seefried in presence of the Military Governor of Metz and a local audience of approximately 40 people. 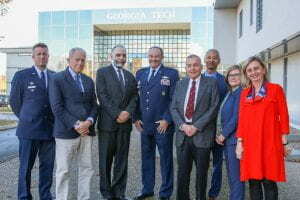 On Saturday, November 10, the GTL group engaged in an all day commemorative excursion with symposium participants–excluding Dr. Seefried, who was in Paris to represent the US Centennial Commission for the main national event hosted by French President Macron–and the addition of Mr. Diego Ruiz Palmer, Policy Adviser to the NATO Assistant Secretary General for Emerging Security Challenges, who brought a unique European perspective to the commentary provided by the US delegation. 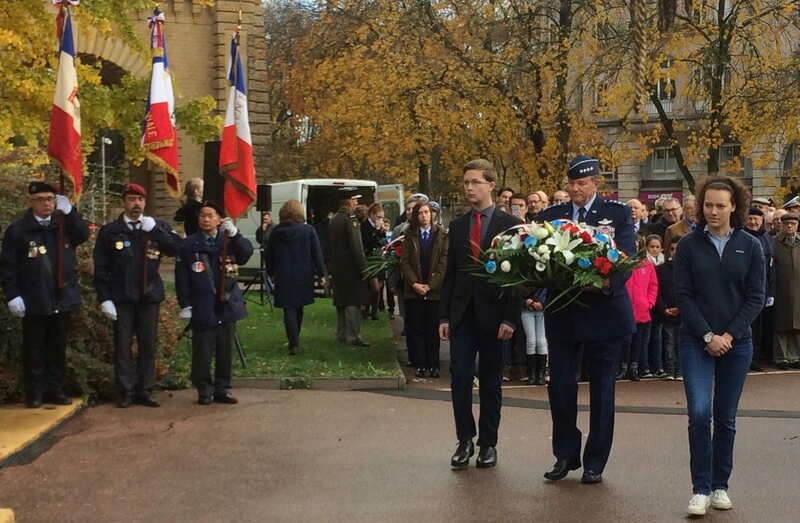 Sunday, November 11th: General Breedlove participated in the formal Armistice ceremonies of Metz at the Monuments aux Morts where he placed a wreath presented by Dr. Vicki Birchfield and GTL students, Liana Rix and Kyle Lundberg, in honor of French-American friendship.